Vitamins and minerals are important for your oral hygiene tooth health just as they are for every other part of your body. Before we get into the nitty gritty about which foods to eat to improve your dental health, let’s talk science. Our teeth are composed of four different types of tissues: pulp, dentin, enamel, and cementum. These tissues are each made up of different minerals. Enamel, for instance, is primarily calcium phosphate. To keep your teeth strong and white, you have to keep refilling them with necessary nutrients – in addition to practicing good oral hygiene. The best way to do that is by incorporating the following healthy foods into your diet (and staying away from harmful foods and drinks like sweets and sodas). Cheese is at the top of the list because it is high in calcium and protein (which are the basis of our tooth enamel as well as the bones that support our teeth). But cheese has additional benefits, too. Unlike milk and yogurt, cheese requires chewing which increases the amount of saliva in our mouth. Believe it or not, saliva plays an important role in oral health – not only does it fight bad germs but it contains even more proteins and minerals that protect your teeth. Celery is another water-based food that can help rinse away harmful bacteria in your mouth. Its naturally abrasive texture also helps clear food particles that might otherwise get stuck on or between the teeth. Finally, celery contains vitamins A and C which are good for teeth and gums. It’s no wonder these dark green vegetables are considered a superfood. They look healthy…and they are! The complex B vitamin folic acid contained in vegetables like spinach and kale promotes cell re-growth throughout your entire body. You might not know it but leafy greens are also high in calcium, making them a hero among vegetables when it comes to your teeth. 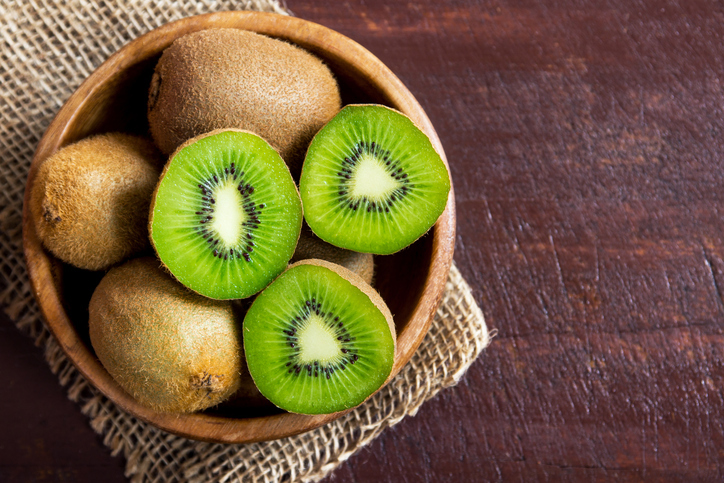 Did you know: Kiwi has some of the highest vitamin C content out of all the fruits? In fact, it has twice as much vitamin C as apples and oranges. Why choose kiwi as opposed to other vitamin C-rich fruits? It has a relatively low acidity level which is important for maintaining strong tooth enamel and a bright, white smile. Fruits with high acidity like lemons and limes actually erode your tooth enamel and, combined with poor oral hygiene, can lead to serious oral conditions. You’ll find these tiny nutrient-packed seeds on many healthy food lists, and not just those pertaining to your teeth. Small but mighty, sesame seeds are high in calcium and have amazing powers when it comes to scrubbing away plaque and bacteria from tooth surfaces. Salmon has what most nutritionists consider “good fats,” benefitting your entire body. It is also a great source of vitamin D which plays an important role in your tooth health by helping your body better absorb calcium. Another good source of vitamin D? The sun! From walnuts to almonds to peanuts, all types of nuts contain a wide variety of vitamins and minerals that are good for your teeth including calcium, vitamin D, and folic acid. Since they require a substantial amount of chewing, they also promote saliva production and all the tooth-healthy benefits that come with it. In addition to the foods on this list, don’t forget drinks like water, milk, and tea, all of which help clear your teeth of any stuck-on food particles and contain essential vitamins that support healthy teeth and gums. Of course, healthy foods and drinks alone will not prevent cavities and gum disease from occurring. You must practice good oral hygiene, including brushing at least twice a day and regular flossing. Get more oral hygiene tips and then contact us to set up your next dental check-up.